Perth summer has left, and winter is a few days away. As much as I love summer, I do look forward to winter - the feeling of lying in bed all warm and snuggly while listening to rain fall outside (cheesy I know), hearty soups and stews, and most of all, the clothes! I bought two coats off Asos a few months ago that were crazy cheap and so beautiful, and I'm so excited that I'm starting to wear them. While I had a bit of free time a few weeks ago, I asked Colin what he wanted for dinner. I got the usual "I don't mind, you decide..". Knowing Colin's love for those hearty winter dishes, I suggested steak and Guinness pies. How can a boy turn down a pie. I think he did a little jump. To be honest, this recipe has been sitting in my 'to-make' list for ages. 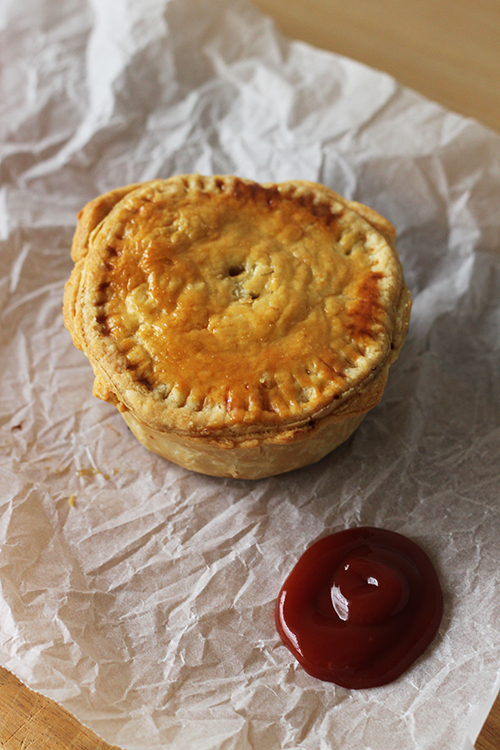 It was on Masterchef Australia episode maybe two years ago - Gary made them during a Masterclass - and I watched in awe, instantly wanting a pie. 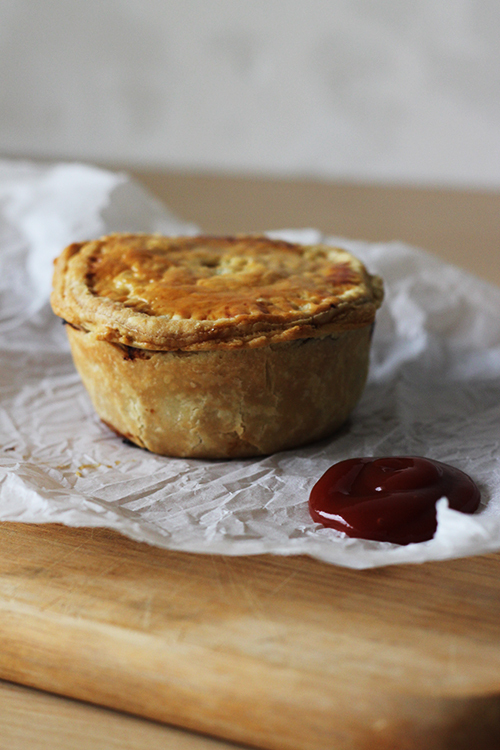 I'm a big fan of pies - love my traditional steak pie. And sauce... oh. These pies were an interesting one. While the stew was amazing and rich and sweet from the onions, I found the pastry to have way to much butter. I had never made shortcrust pastry before so I wasn't familiar with the quantity of ingredients needed. If you have an awesome shortcrust pastry I suggest you use that. I have edited this one so there is less butter. With a rich stew, I don't think you need a rich pastry. Also, a texas sized muffin tins is the perfect size for these pies! In a large pot on a medium heat, add a good slug of olive oil, the sliced onions, garlic and thyme. Cook for around 20 minutes with the lid on until they have become soft and caramelised. Remove the onion mix from the pot and set aside. Turn the heat up slightly, add a bit more olive oil, then brown off the meat in batches (couple of minutes each batch). Once nice and sealed, add the onion mix back the pot, along with the flour and stir well so the flour cooks off. Add a good few pinches of sea salt and a generous grind of black pepper, then add the whole can of Guinness and the 500ml of stock, stir, and bring to the boil. Cover the pot and place in the preheated oven for around 2 hours, or until the stew has become nice and thick. Remove the stew from the pot and set aside to cool (you can put it in the fridge, you just don't want to put hot stew onto pastry as it will make it soggy). To make the pastry, place the flour and butter into a food processor. Pulse the mix until it has a crumb texture. Add the sea salt and sour cream, then continue pulsing. Pour the mix onto a clean counter, mould into a ball, cover and put in the fridge to chill. When the stew has chilled, you can start moulding the pastry. Roll out the pastry using a floured surface and rolling pin. Using a circle shape the size of the texas muffin tin (or your choice of large muffin sized tin) and cut out 6 pie lids. Put those to the side and roll out more pastry to make the bases. Using the same circle cutter as a guide (I used a champagne cocktail glass by the way, so use anything that fits the size! ), cut a circle around 2cm larger than the guide. This will ensure you have enough pastry to fill the whole mould. Place the pastry bases into the tin, using your fingers to make sure it push it into shape and draw the pastry so it sits above the top of the mould. 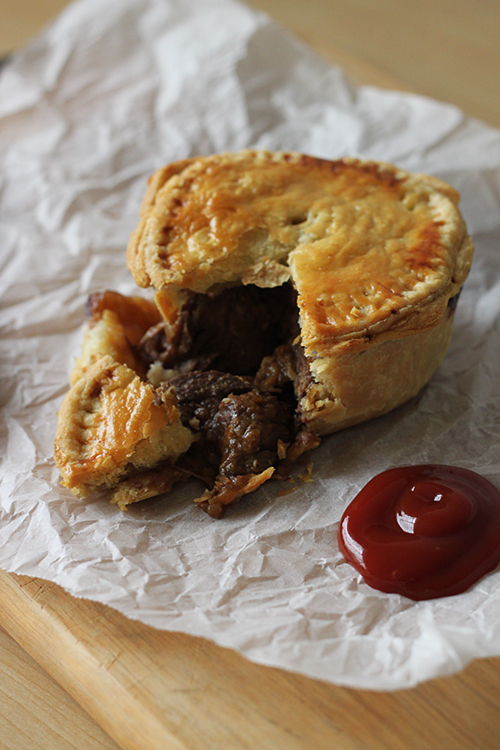 Fill each with the beef stew, then brush a little water around the pastry edges and put the lid on top. Press the edges with a fork to make sure they are sealed, then brush the tops with the beaten egg. Place in the oven for around 30 minutes, or until the pastry is golden and flakey. Allow to sit for at least 5 minutes before eating. It's lovely to have a blog coming from Australia (where I live,too) so that I can use the seasonal recipes straight away and not have to file them away for another six months! Thanks Jan! I agree, I have so many recipes filed away waiting for the right time of year to make them, I end up forgetting about them.. I live in the US, and was an exchange student to austraila in 1982. I had such a fabulous year! but have to ask you, do you feel isolated, living in Perth? so far away from the rest of the world and the rest of Australia. I made it to ayres rock and adelaide, but thats as far west as I went. This is a beautiful recipe. Honestly, beautiful. You're added to my feed reader — I discovered you today and I'm already in love! Amy, thank you for your lovely words!! I was a bit skeptical about sour cream pastry, but when I googled it (along with Maggie Beer) there were a lot of positive comments. I might need to try it again. This looks delicious! I'm adding on my list of things to make for my husband. I have a food group that would LOVE this recipe http://www.kumbuya.com/restaurant-reviews-recipes/ can I share it with a link back to this post? Please let me know, thanks! Oh boy, they look delish. Whilst it is (apparently) summer here in the UK, I had to put the heating on this morning. PS First time visiting you, I'll certainly be back! I am so glad to come across your blog! I'm making meat pies for an Outlander themed party and want to use muffin tins to make it easier. I am going to "practice" with your recipe tonight. It looks/sounds fantastic!